Administrators (‘admins’) have additional rights over other users. If you are an Admin you can grant another teacher admin rights. Think carefully before taking this step though because that person can then act on behalf of your early learning service's Storypark account. You must have a high level of trust in that person, particularly as they can invite other people to view a child's profile, and delete your early learning service’s account. Go to your early learning service’s profile page and click the 'Teachers' tab. 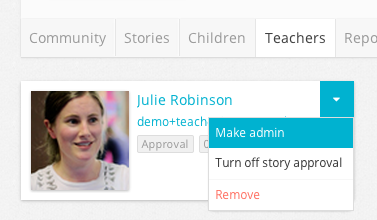 Find the teacher to whom you wish to grant administrator rights, click the arrow in the top right corner of that teacher's tile, and from the drop-down menu select 'Make admin'. That's it.